This page will provide you with quick news and updates relative to content on our website. We might also later include a blog of sorts. The word spread quickly tonight that Richard Kimball had passed away. He left an indelible mark on the music industry, particularly his pioneering work on the mighty KMET in Los Angeles.. But most of all, he left unforgettable memories for all of his myriad friends, acquaintances and listeners worldwide. Although I worked with him in the music business in the 70's, I'm proud to say that I got to know him much more as a person in recent years and I'll treasure those experiences. May he Rest in Peace. A group of 70's music industry veterans get together quarterly to renew friendships, share memories and generally enjoy each other's company. This photo was from our July 17, 2018 event . We will have additional photos from this get-together posted elsewhere on our website soon. We just received word of the recent passing of well-respected, ex-MCA/Universal executive Pat Pipolo. Rest in Peace. More sad news this week, unfortunately. Jerry Hopkins, one of the most respected (and true to his craft) rock and roll journalists and authors, has passed away after a long-time illness in his adopted home of Thailand. His books on The Doors, Elvis, Jimi Hendrix, David Bowie and so many more epitomized the music scene in the late 60's and the 70s decade. His voice will be missed. Two more giants of the entertainment industry passed on in mid-May: Renowned super publicist Paul Bloch and beloved record company leader Russ Regan. Early March marked the passing of two more music industry giants: Graphic artist and album cover designer Gary Burden and Gregory Sill, independent music supervisor and music/television executive. May they Rest in Peace. ​With sadness, we acknowledge the passing today of uber publicist and writer Bob Levinson. He was pivotal in the success of so many music industry talents. His cause of death stemmed from pneumonia. ​We absolutely are heartbroken that this "News" page has developed into a lead-in to the Rest In Peace section of the website. But this morning we got word of the sad, unexpected passing of veteran music industry writer and editor Sally Stevens. Early information indicates that the cause of death was complications from bronchial pneumonia stemming from the flu. Funeral arrangements are pending. Another sudden and sad passing last week...public relations and publicity notable Ron Scott. RIP. Sadly, I just heard about the very sudden passing of one of my best friends from the music business days...and thereafter. Bob Kirsch. Just spoke with him last week. His daughter Jennifer posted about Bob's passing on her and his FB pages. He truly was one of the genuinely nicest people I've ever known. ​REST IN PEACE: Another great one passed away this month. We are sad to announce the passing of legendary editor and writer Frank Barron, who died at the age of 98 this past weekend. ​REST IN PEACE: With sadness, we report the passing today of Lita Eliscu Dove. You can check her Facebook page for more information, via her daughter. REST IN PEACE: Two sad passings over the past couple of weeks. Jay Lowy, longtime publishing icon and Lydia Woltag, a super public relations specialist. Both have been added to our site's Rest in Peace section. They will both be missed by friends and colleagues. MUSIC INDUSTRY REUNION (Los Angeles 2017)---​​We just added a group of photos from this weeks large and very successful Music Industry Reunion event, at the Canyon Club entertainment complex in Agoura Hills. Lots of industry veterans there, many of whom had true roots in the 1970s music industry. ROCK & ROLL OUTDOOR BILLBOARDS---New Section Just Added to our Website One of the hallmarks of the rocking 70's was the use of outdoor billboards to call attention to new albums, concert dates or inflated egos (LOL). Some very remarkable artwork was displayed, particularly up-and-down the Sunset Strip. We've added some key samples of those billboards, courtesy of photographer Robert Landau's best-selling book, "Rock and Roll Billboards of the Sunset Strip". Here's a link to that section. DO YOU HAVE MUSIC INDUSTRY MEMORABILIA THAT MIGHT FETCH A LOT OF MONEY IN AN AUCTION? Heritage Auctions is a well-known and highly-reputable auction company that has a specialty niche in music memorabilia. 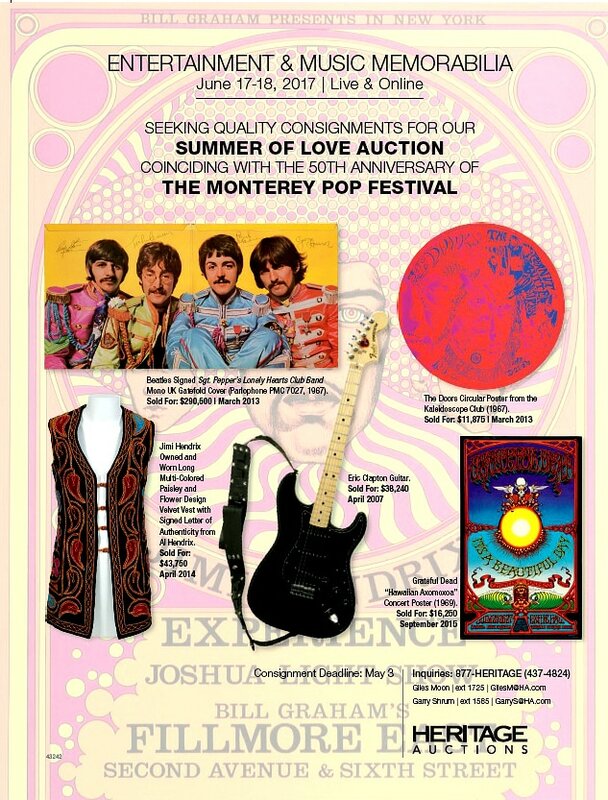 Their next auction is a huge one, dedicated to the "Summer of Love" time period, also coinciding with the 50th Anniversary of the Monterey Pop Festival. It will take place June 17-18 live and online and they have been collecting items for more than a year for this special auction. Do you have items that might qualify? Now's the time to find out. Their music industry coordinator is one of our own, Renee Pappas, who is collaborating with Heritage Auctions. You can contact her via email at: reneedpappas@gmail.com The final consignment date for all items for this auction is Wednesday, Wednesday, May 3. Contact Renee if you are interested. The (below) flier shows a few of the recently fetched prices for items that fall under the theme of the auction. After a series of staggered starts, this website has been "up" for about a month now and I am positively thrilled by the responses from those who have visited the site. It underscores the fact that memories are powerful entities that can bring warm feelings very quickly. 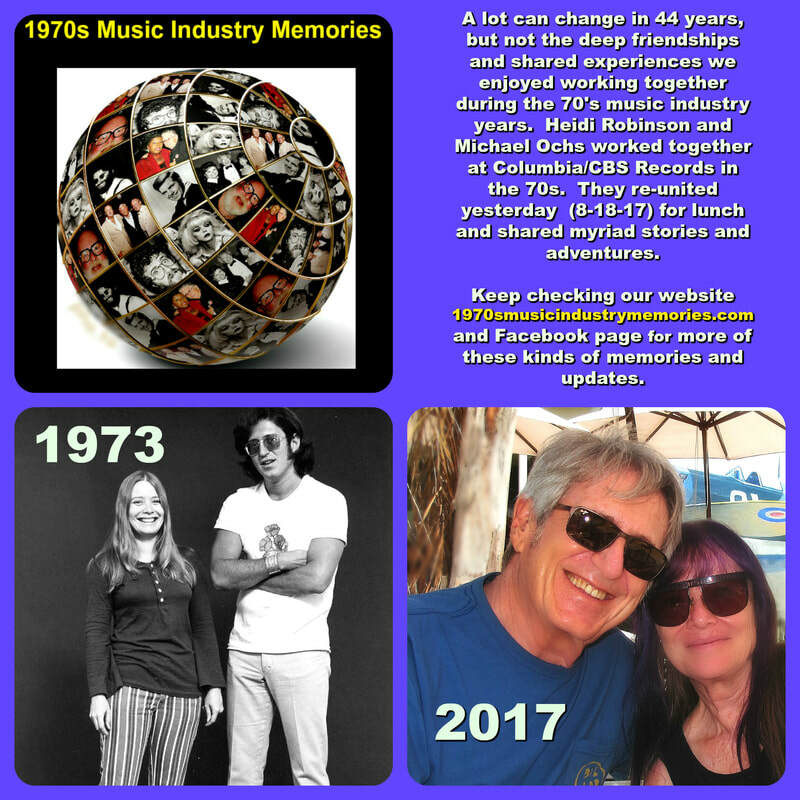 For me, those feelings were always a part of my experiences in the music industry from the late 60s through the mid-80s on the West Coast. I'm glad I'm able to share them with many of you who were also part of that scene. And to those of you who just have a curiosity of what went down during those crazy days, I hope you can visit the site often. Sharing is the keyword. Many of you have already shared (with me and then I posted on the site) your photos from the 70s music industry. It would be great if more and more of you found some of the photo memories from those days and were able to share with our audience. By looking at the site, you can tell exactly the kinds of photos we are seeking. ​We also just added a lot of new photos and pages to the site, including new photos from the private collections of Abe Hoch, John Gibson and Russ Bach. Plus we added several recording studios to that section, including Pacific High and Fantasy Studios in the San Francisco area.